Test Sieve Inspection/Calibration Procedure - Gilson Co.
Verification measurements are performed on conventional Compliance sieves to upgrade to Inspection or Calibration ASTM or ISO specifications. A selected number of openings of each sieve are individually measured using an NIST traceable optical comparator before shipment. Automatic scanning of the sieve by a computer system produces a statistical analysis backed by documentation appropriate to the desired grade. There have been extensive revisions to ASTM standard E11, “Specification for Wire Cloth and Sieves for Testing Purposes.” Gilson is leading the way in educating our customers about the new specification and making these new products available. The new specification affects all test sieves, screen trays, and wire cloth, and changes the way the mesh openings are evaluated by looking at the statistical distribution of aperture sizes, rather than just the average opening sizes. Inspection sieves have a specified number of openings measured in each sieve after the cloth is mounted in the frame. There’s a 99% confidence level that the standard deviation of these openings is within the maximum allowed by ASTM or ISO. This is a good option when accuracy and repeatability are critical. Calibration sieves have about twice as many openings measured as Inspection Sieves. The higher number of openings increases the confidence level to 99.73% that the standard deviation of these openings is within the maximum allowed by ASTM or ISO. This is a good choice when a very high degree of accuracy is required. Compliance sieves are manufactured with wire cloth that has been inspected and measured in roll or sheet quantities prior to being cut and mounted in individual sieve frames. These are standard sieves, designed for applications where a normal degree of accuracy and repeatability is sufficient. All Gilson Test Sieves meet ASTM or ISO requirements for Compliance Test Sieves. To order Verification with new sieves, see ASTM Test Sieves or ISO Test Sieves. Sieves with backing cloth installed cannot be verified to Inspection or Calibration grade. 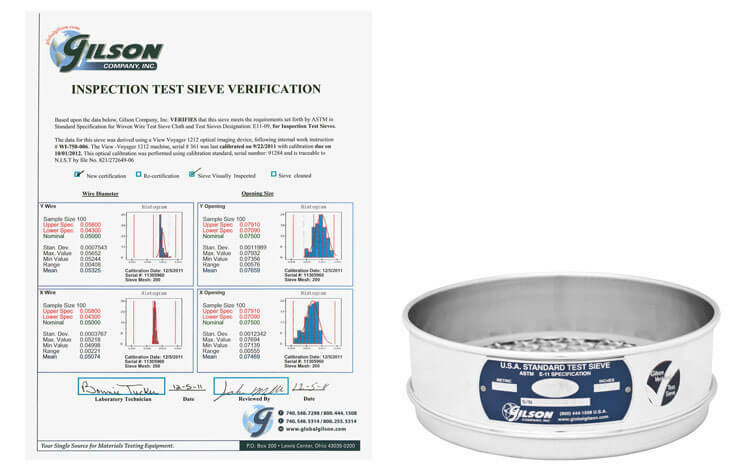 To learn more about how to verify test sieves, read the Gilson Insights blog post, A Guide to Acing the Sieve Grade Selection Process.